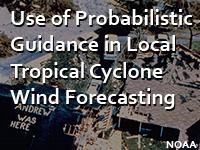 This lesson describes the role of forecasters in supporting emergency managers during tropical cyclones with a focus on the wind hazards. It provides an overview of the wind speed products produced by the National Weather Service, including how they are used to create local wind forecasts. Learners will practice interpreting probabilistic wind speed guidance and conveying appropriate wind speed information to decision-makers using projected scenarios of hazardous wind events. Developing messages for emergency managers and the public that include the potential wind speed, threat, and impact information are also explored. This online lesson is part of the Tropical Cyclone Storm Winds: Forecasting and Communication course. There are a multitude of graphic displays thrown out in this material, which wasn't easy to take onboard. The question which asks you to identify the primary use of seven specific programs is not really supported by the discussion material. Very informative and well done module. Assess the most likely time of onset for tropical-storm-force winds (> 34 knots) for any location within a WFO’s area of responsibility; repeat for hurricane-force winds (> 64 knots). Assess the most likely time of onset for the strongest winds of the event for any location within a WFO’s area of responsibility. Convey uncertainty information about the wind forecast at a particular location as influenced by potential errors in the forecast track, intensity, and size of an approaching TC. Recognize the potential wind impacts of a TC upon a WFO’s area of responsibility, and derive an appropriate wind message for societal response. Incorporate partner and user needs into NWS products and services to enable more effective decision-making.